Story: A testimony of one man’s faith and his journey into freedom…. This man and his wife were the first believers in Jesus within this village. They came to know the Lord seven years ago. Yet dee was addicted to opium and smoked it daily, despite being married and the father of five kids. One day a pastor from their province came and led worship and preached in their village. Yet Dee says he felt joy and happiness in his heart when the singing was happening. After the pastor left, Yet Dee felt different and had problems come about with certain areas of his life, including his health… Buddhism and Animism didn’t answer these problems. He called the pastor to come back and he then professed faith in Jesus Christ and was baptized. He still smoked opium for three years, even though being a believer and worshiping;however, he says one day he was reading the Bible and came across passages about the body and heart needing to clean. He states that that on that day he quit on the spot and has not touched it since. God met him where he was at on his journey to freedom. Since then six other families have come to know the Lord, there is a church in the village in which they worship weekly, and they gather and worship in different homes weekly as well. Yet Dee has attended bible training courses and says he has seen physical and spiritual blessing in the lives of himself and family. 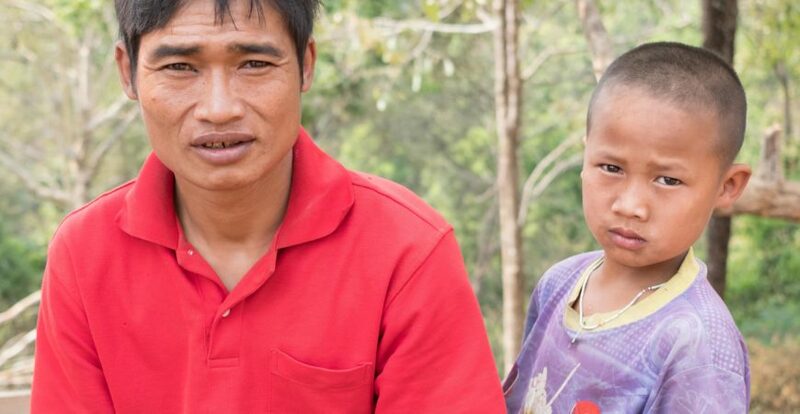 He currently has two kids still attending the school in “Glae lah blah” and he is one of the volunteers who helps out around the school and in the community in tandem with being a farmer.